This is one of my favorite Halloween digi images from Bugaboo. Colored the kitty with Copic markers. Other supplies used: Spellbinder dies, buttons, ribbon and twine. The green background layer is a scalloped circle die cut that I cut in half and centered behind the candy corn paper. You did a beautiful job and I would say it is one of my favorites but I have so many from them that I love. This one I really need to pull out and case for two friends who love cat. I love the bright colour palette and the addition of the tine is great!Thanks for joining our Fall Theme Challenge at Bugaboo Stamps this week – good luck in the draw! Please check out our new challenge this week as we’d love you to see another of your lovely creations! Love this image too. Sweet Halloween card. Thank you for all of your sweet comments on my recent posts too. Have a great weekend. Cute card, wow this is gorgeous, thanks for joining in our challenge this time of buttons and bows....awesome card. Cute as can be with perfect colors too! Adorable! One can never go wrong with a Bugaboo image! Thanks for joining us at Pile it On! Good Luck! So sweet! love the card layout, and all your great papers show off the kitty so well! Oh what a cute Halloween cat card. Absolutely lovely!! Thanks for joining us at Kitty Bee Designs for our Aloha Friday Dies and/or Punches Challenge. Great paper combo and isn't that the sweetest image! 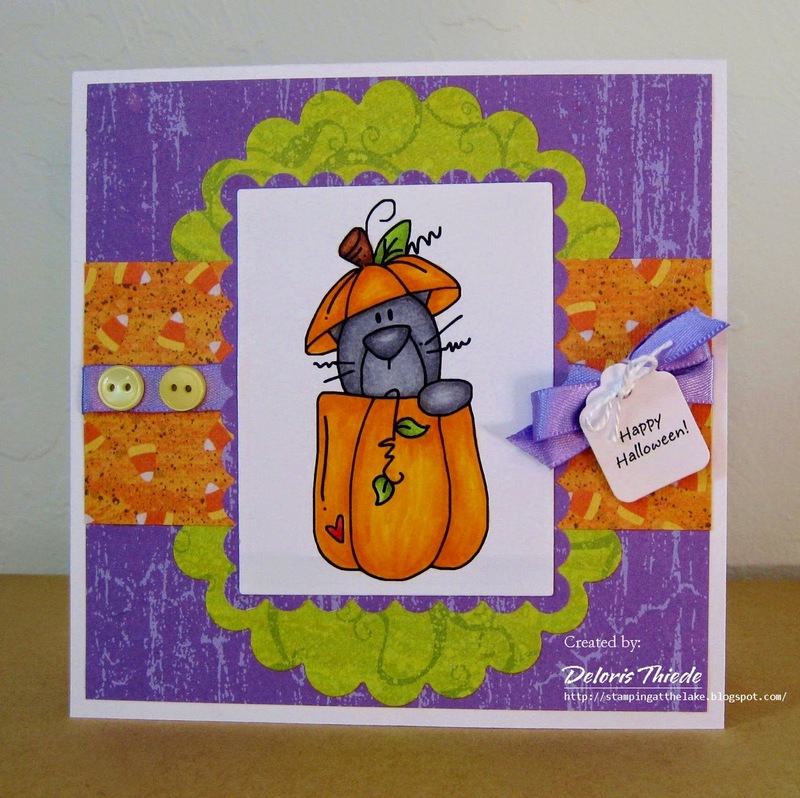 Thanks for also sharing at our Halloween Linky Party for Craftin' Desert Diva's! Gorgeous!! Great papers.. Love the added buttons!! Wonderful!! Thanks so much for playing along with us at Open-Minded Crafting Fun Challenges!!! Good Luck! I hope we see you again!! Lovely card. Thanks for joining us at CFAS.